We woke up early with the boat bathed in brilliant sunshine – it was a clear invitation to get up and spend some time outside. With the dogs walked, we moved the boat from the moorings – this took some time! The bow mooring rope (which had been wetter than the stern ropes) was frozen solid and was behaving more like a length of rigid cable – it took a while to get it untied. 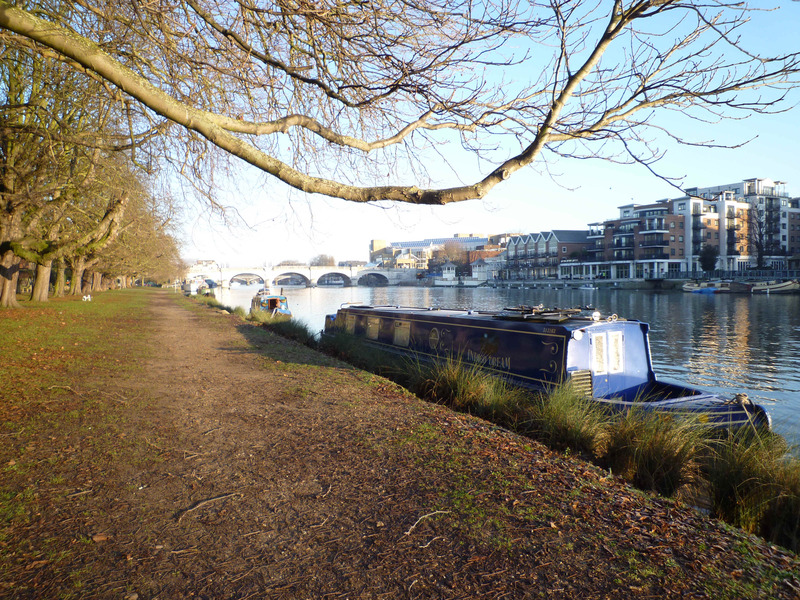 We could have stayed on the mooring until the rope had defrosted in the sun, but it was time to achieve one of our boating ambitions – tying up outside John Lewis and doing our Christmas shopping in Kingston! There was plenty of space on the JL moorings so our ambition was realised. We left the dogs on board and headed off into town. We hadn’t provisioned the boat at all, so the first stop was Costa for breakfast before enjoying a wander round the market that was just being set up. 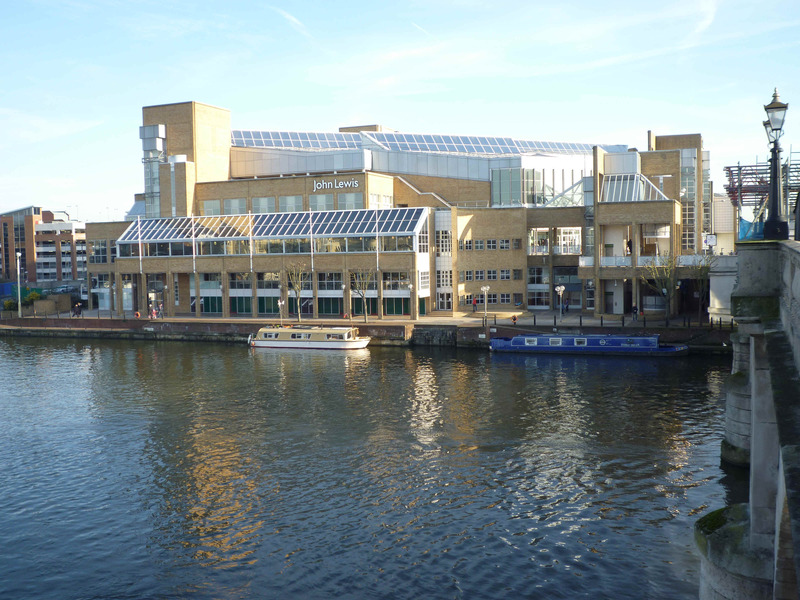 We then got on with the gift shopping – my goodness, Kingston’s so up-market now…..
With the essentials done we got back to the boat – we’d assured an ecstatic welcome by buying the dogs a (cheap) hot chicken from Waitrose. Blue was very appreciative but Lou’s off her food – she’s having a run of poor health at the moment (various causes) and we’re working with the vet to get her treatments right. I do worry about Lou, but it was too glorious a day to be worrying about anything really. It was seriously cold – the bow mooring rope never did defrost – but it was brilliantly sunny and the sky was that crackling shade of blue that you only get on a cold winter’s day. We contemplated going straight back to Teddington and thence to home but we couldn’t resist a little potter along the river. We needed to run the engine for a few hours in order to charge the batteries so we might as well be on the move. 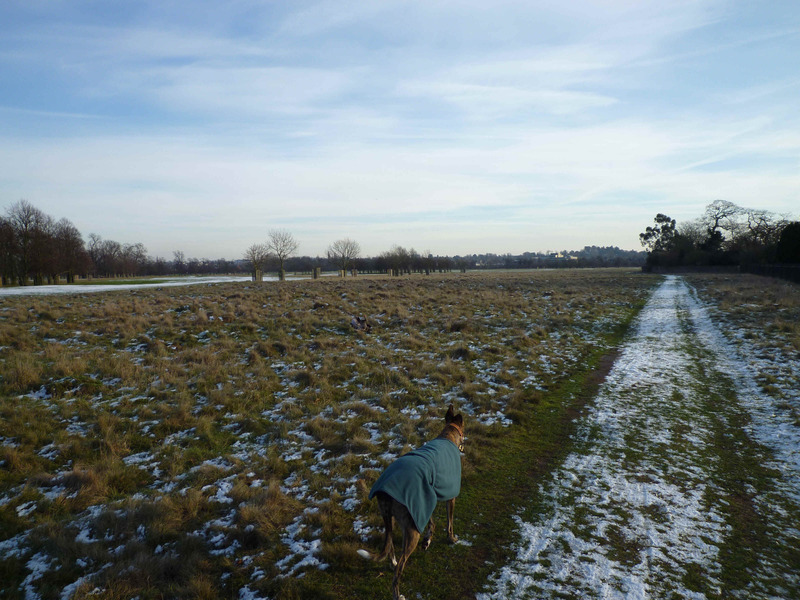 The river loses some of its grandness here, though the extensive parkland that flanks the right banks speaks of Hampton’s Court’s ongoing influence – what a luxury to have this vast green space in an otherwise built-up area. The left bank and the islands (or aits) are crowded with a mix of housing ranging from the expected houses and apartments to the quirky bungalows that crowd every inch of the riverside. I noticed that Raven’s Ait, an island housing a once-famous hotel, is now surrounded by a security fence (flimsy) and signs warning that a security firm patrols there. The island was briefly occupied by squatters after the hotel closed – I guess they’ve been moved on! The John Lesis Moorings (just downstream of the bridge) - sweet! We stopped off at Thames Ditton Marina to pick up a new calor gas cylinder. We’d changed the cylinders over ages ago but we’d completely forgotten to replace the old one. We were nowhere near running out of gas but it is nice to have a backup on board. We carried on upriver, making and discarding plans as we went along – should we stop at our favourite riverside pub, the Albany, for a spot of lunch? What about going up to the lock, or through the lock, spending the night on board, going home…….too many fine options to choose from! Luckily Blue made the decision for us – he’s an action dog so he was agitating for a walk, very loudly. So we achieved another boating ambition – to stop at the Hampton Court Palace moorings (on the right bank just by the golden gates – FREE for 24 hours) and have a wander round the parkland. The dogs had an excellent rummage here, especially when we found a path onto the rough ground at the edge of the golf course. 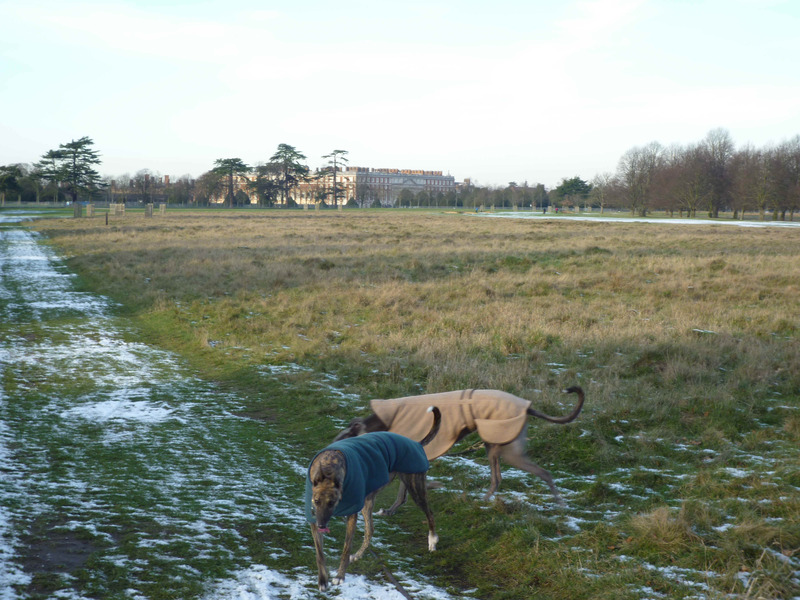 It’s a fine place to walk,well-fenced, no roads and magnificent backdrops – the river, the parkland and Hampton Court Palace itself. 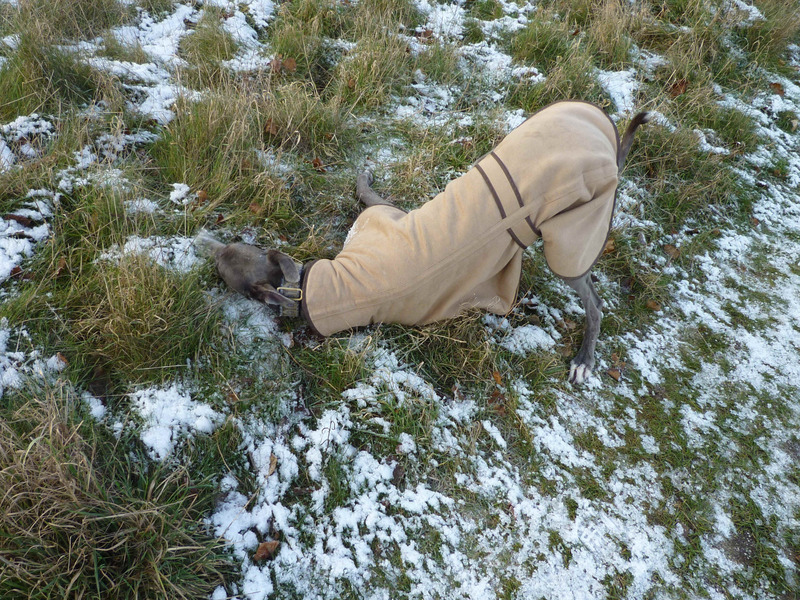 There was a dusting of snow on the ground and Blue went completely bonkers – alternatively running around at top speed and throwing himself down to rub his face in the snow and to roll around in the long grass. Lou chased him a few times before pulling up lame (chronic knee rather than new injury). That was the sign that they’d had enough (Blue disagreed!) so we wandered back to the boat well contented. 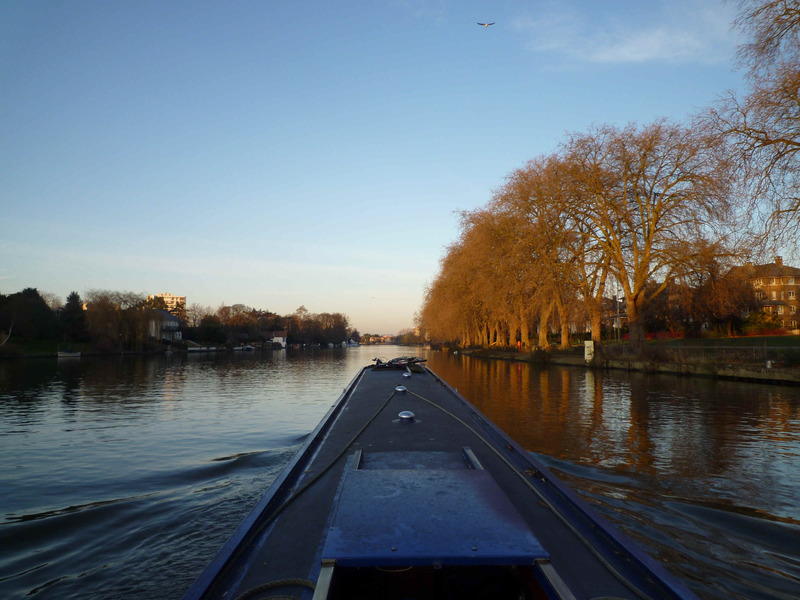 On such a fine day it was easy to think that we had lots of cruising ahead of us, but the fact was that we’d only have the daylight for another couple of hours, so we turned back towards Teddington. The trip back was a lot faster – although there are no flow warnings, there’s plenty of water in the river and it exerts quite a force! 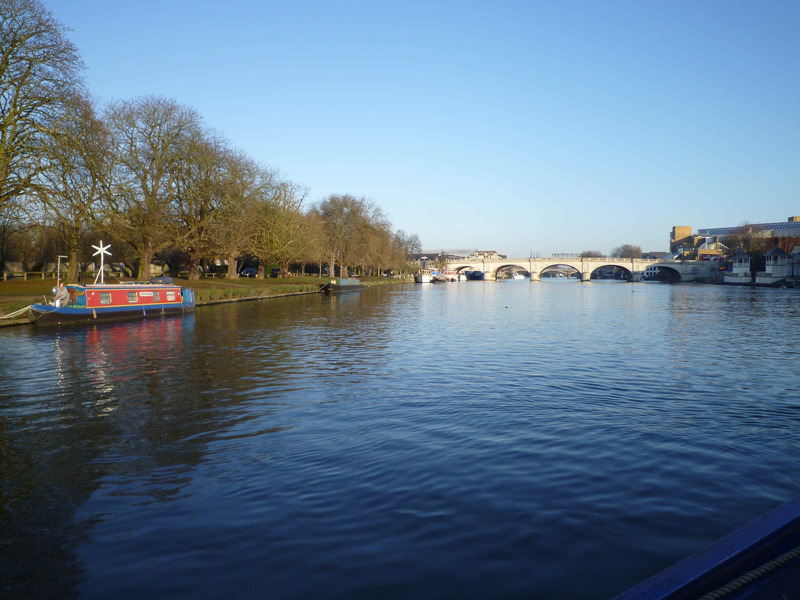 As we cruised back I felt an overwhelming desire to live on the river – wouldn’t it be great to buy Raven’s Ait (with my triple Euromillions lottery win, which would admittedly be more likely if I were to buy a ticket!). It’s not practical, of course, we’d spend at least one month a year stuck in one place while the river was on red boards. But today the longing to live on the river filled me completely, the idea making my mouth-water as much as the black truffles served at yesterday’s dinner. We stopped off at the John Lewis moorings on the way back, just for the hell of it! This time we took the dogs for a wander into town. We’d spotted a german bratwurst stand being set up in the continental-style market earlier and stopped off for a late lunch. Blue loved the market – he sent all his time hoovering up sausages that people dropped around the stand. This was not an indication of their quality – we had a superior hot-dog here – barbecued bratwurst in proper french bread – yummy! We followed this with a freshly toasted waffle from an adjacent stand. Richard bought me an extremely silly hat to go with my super-colourful winter fleece. Kingston’s Christmas market doesn’t yet compare with it’s European counterparts in Lille and Bruges but it’s a good start – we had a thoroughly enjoyable hour here. Of course, our enjoyment was greatly enhanced by the fact that we’d had a lovely cruise and moored up in town without queue or congestion. 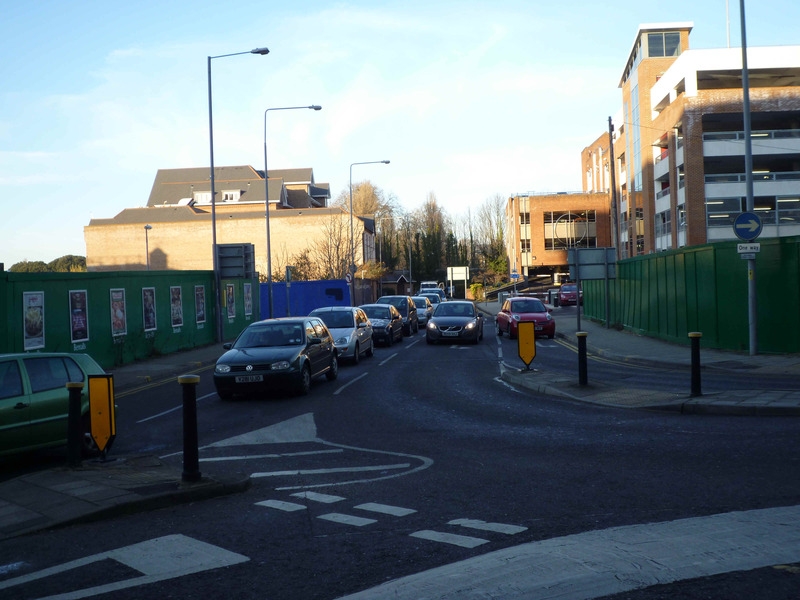 A local shopper told us that they’d queued for 45 minutes to get into the car park! We moored a little way beyond the sunken boat but after a chat with the lockie (to pay for another week’s moorings) we moved a little further away. Apparently the wreck’s being moved next week and they need at least a boat length either side to get the lifting equipment in. The tide was high, very high, the tidal water was only a few inches below the top of the weir – we checked our ropes again! The queue into the John Lewis car park - ha ha ha!!!!! We’ll be at Teddington for until the 27th then we’ll head off back to the canal (provided it’s not frozen solid). I’m not sure whether we’ll be able to fit in a few jaunts along the river between now and then – I suspect we’ll be too busy stuffing turkeys and whatnot…..
We took a good hour to offload, finding ever more excuses to delay leaving the boat. In the end the rapidly dropping thermometer forced us into the car – ideally we needed to be home before our road froze into the Surrey equivalent of the cresta run! We got home by 6.30pm and the temperature was already minus 4…. As we drove home we were a bit amazed to see that nothing much had changed – we were driving into a landscape increasingly covered with snow. We realised that we’d been away from home for less than 48 hours – it felt like much longer – Indigo Dream is obviously a time-machine, warping a few hours of cruising onto a week’s worth of relaxation. It’s a huge understatement but we’re having a particularly enjoyable time on the boat at the moment. I don’t know what it is, but there’s a really magical feel to it. Maybe it’s because dry sunny days on the river are such a gift after a soggy November; maybe it’s because we’re close to home and that makes getting to/from the boat so much easier. Whatever it is, our days on the boat have all the relish of a fine vintage, to be savoured to the full…. In case we don’t post before Christmas we wish you a Happy Christmas followed by a merry and prosperous new year. This entry was posted on 23 December, 2009 at 3:51 pm	and is filed under Uncategorized. You can follow any responses to this entry through the RSS 2.0 feed. You can skip to the end and leave a response. Pinging is currently not allowed. Great photos as usual, made me smile the queue of traffic into John Lewis, we have sat there numerous times when we lived in East Molesey, somedays the queue from Kingston went back to Hampton Court. Sorry to hear Lou is off her food, hope she gets better soon. Mickey has finally learnt how to get on the sofa so will often run in from the garden and straight on to it, the sofa is white and his feet muddy, well he says that muddy dog in the advert jumps on the bed so why shouldn’t he do it on the sofa. I liked that advert with the muddy dog – our house is beyond description after a soggy November! I guess from your sign off that you’ve lost poor old Sam – I’m so sorry – he was such a loveable hound but had great long life which is what we all hope for…. Lou is getting there – she’s in a bit of pain with her arthritic knee (and a cut on her foot – that was yesterday’s drama). When I get her painkillers right then she’s full of beans, then she overdoes it and is then miserable – I’m working on getting the balance of painkillers/exercise right so that she’s not quite so up and down. Mind you, there are boiled turkey giblets on offer this afternoon – I’m sure that there’ll be nothing wrong her appetite then….. Sorry I thought we had told you about Sam, it was the middle of October one morning we got up but he wasn’t able to, his old back legs had finally given up so we knew it was time. We will look at getting back up to three greys in the new year. Our main problem is the ice where it keeps thawing and freezing overnight and the roads to the village are not gritted, apparently one of our neighbours used to work for the council and he fell out with the guy in charge of gritting so the gritters never make it to us. Let us know if you come up to Hersham for another hound – it would be lovely to see you and if you fancied a cruise, well, the boat’s going to be around London until March and then we may take a little trip down the Wey in the Spring (virtually in Hersham’s back yard!). I do hope river conditions allow you to get off, I notice there is a lot of ‘stream increasing’ and ‘strong stream’ warnings. Just wanted to let you know I made your christmas pud with my grandson and we ate it yesterday. It was delicious – even though my grandson would not allow me to lace it with any more alcohol! Hi Kath, Merry Christmas and a Happy New Year! So glad that you enjoyed the pudding – funnily enough, although I’m really really particular about how it’s made, I don’t eat it myself (have a thing about sultanas, don’t ask!). By sheer chance we resisted the temptation to moor upstream – then we would have been stuck! We were moored just up from Teddington Lock so we had no problem, though the combined force of the outgoing tide and the floodwater coming down made for a very fast trip to Brentford!